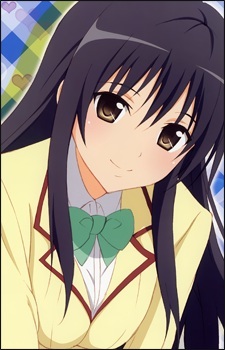 Yui is a girl in Rito's class who seems a good deal more conservative than the others (except in the anime, where she's downright being portrayed as a school nazi, ruling the hallways with an iron fist), which is partially caused by her prettyboy brother and his habit of going out with different girls on a regular basis. She quickly comes at odds with Lala and her free-spirited personality, which she sees as a hindrance towards making the school a more peaceful and better place. Eventually, she loosens up a bit, but she's generally more on her guard than the other girls. She becomes a part of Rito's harem all the same. It is also implied (albeit rather briefly) that she might have feelings for Rito. She admits to herself that she is in love with Rito in To LOVE-Ru Darkness. Throughout the series, Yui's love interest has developed. Originally thinking he was just a "Shameless," boy, she realized how she was wrong after seeing Rito's kindness around town. Later at a group picnic, Yui told Rito that she state that "I won't let you do shameless things with anyone else but me!!" However this was because she was under the influence of pollen that caused all the girl's to fall in love with Rito. Yui also made chocolate for Valentines Day, even though she claimed to him it was just "Giri (Obligatory) Chocolate," but really it was only for him. In To Love Ru: Darkness, While Momo is trying to further her Harem Plan, in which Rito will marry all of the women who love him, she influences the weather when Rito and Yui are walking home so that they go to Rito's house for shelter. While there Yui starts to confess to Rito, stating how it is normal for boys to do "Shameless things," and nearly comes close to kissing him, but she backed out. Yui announced her love for Rito, albeit only to herself, she finally came to terms with it.